Did you know that Hong Kong pet parents are some of the most devoted dog and cat guardians anywhere on the planet? We didn’t, until we chatted with Dr. Alane Kosanovich Cahalane, the first board-certified veterinary specialist in small animal surgery to practice in that beautiful country. Join us for a special two-part convo with Dr. Cahalane. 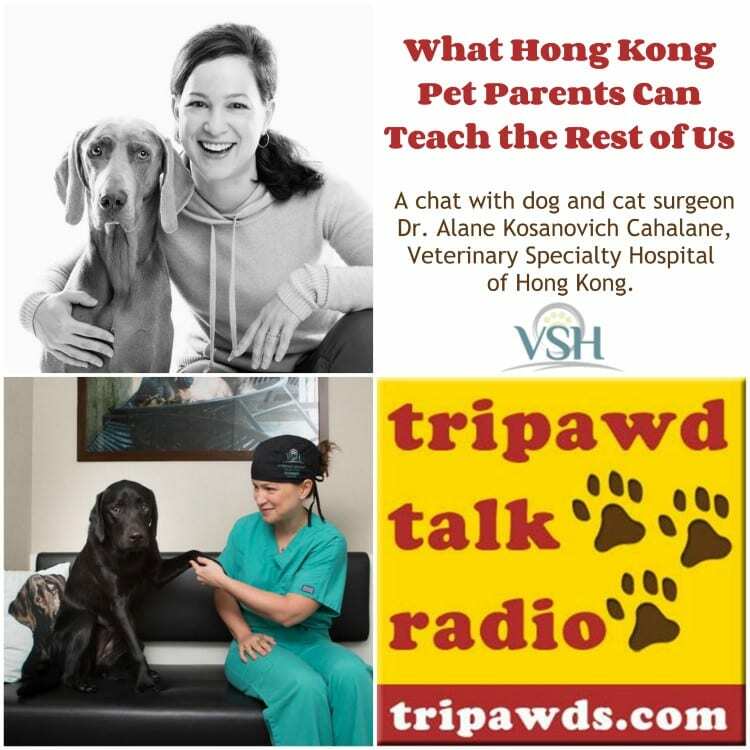 Today on Tripawd Talk Radio, she gives insight into her clients’ exceptional love and care of their beloved dogs and cats — and what Hong Kong pet parents can teach the rest of us about furry family members. Tripawds members arrive here from all around the world seeking guidance and support. To better serve in their time of need, it helps to have a better understanding of veterinary care around the globe. As we mentioned when we interviewed New Zealand veterinarian Dr. Alex Avery, our goal in this blog is to share more international perspectives from veterinarians and pet parents alike. In this special two-part Tripawd Talk Radio segment, we learn why Hong Kong pet parents are some of the most devoted anywhere in the world. Our tour guide is Dr. Alane K. Cahalane, DVM, BSc, MA, DVM, DACVS, of Veterinary Specialty Hospital of Hong Kong. Catch every detail of our interview with Dr. Cahalane in the full transcript below. Jim: This is a first of a 2-part series with our guest who is calling in from the farthest point of any interview we have ever produced here at Tripawds. Dr. Alane Kosanovich Cahalane is the first board-certified specialist in small animal surgery to practice in Hong Kong at Veterinary Specialty Hospital of Hong Kong. She specializes in orthopedic, neurologic, cancer treatment, and soft tissue surgeries in companion animals. Prior to practicing in Hong Kong, Dr. Cahalane spends several years in a busy specialty referral practice in the United States. She has witnessed some rather interesting details about pet parenting in Hong Kong which differ a bit from the way those of us in the West view and treat our dogs and cats. We will discover what we can learn from the relationships her clients have with their pets and don’t miss part 2 of our discussion where we will learn about the NotOneMoreVet campaign and why that is so important to all pet parents and anyone working in the veterinary industry. We clearly have a lot to cover so let’s get started. Thank you for joining us, Dr. Cahalane. René: Hi, Dr. Cahalane. This is René and I am thrilled that we’re talking to you. After I saw your Instagram post, I was like, “Wow! We have to have her on Tripawd Talk.” So thank you. Dr. Cahalane: Oh, I’m very happy to join you. And thanks for checking me out on Instagram. I follow you guys too and I’m always happy to see the things that you’re posting as well. René: Oh, thank you. And just for our listeners, what is your Instagram handle so they can follow along with you? Dr. Cahalane: It’s @dogcatsurgn. I think the other one was taken at the time. So @dogcatsurgn is generally how to find me on Facebook or Instagram or Twitter, all the rest of that kind of stuff. It’s easy thing to remember. René: It is. It is. And we will be sure to put that link in our podcast episode blog post. So you’re all the way in Hong Kong and this is really exciting for us because at Tripawds, we are trying to get out of our North American bubble and really explore how the veterinary community is in other parts of the world. So recently, we had a vet too who is from New Zealand. And now, you are our next international vet but you’re really – you’re from the States. You’re just practicing there, correct? Dr. Cahalane: That’s correct. I am American. I grew up in Canada so I – and now I’ve lived in Hong Kong just about longer than I have lived anywhere else at one good stretch of time. So, I’m from a bit of everywhere. René: Wow! That’s exciting. You are truly international. So what drew you to Hong Kong other than the wonderful title of being the first board-certified specialist there in surgery? What about Hong Kong made you want to go practice? Dr. Cahalane: It’s funny. At the time when I first moved here, Asia wasn’t really on my radar. I had travelled a good bit to Europe and Africa and I did like to travel a lot. I had two very young kids. My daughter was two years old. My son was 12 weeks old when we moved here. My husband had a lot of flexibility in his career. So it wasn’t really Hong Kong that drew me so much as the opportunity as a specialist to start something or to be part of the start of something, I have to start it myself, but to be part of the advancement of our profession in a certain part of the world. So I came here to be a specialist, to train other people to become specialist or to become better surgeons and then everything just sort of taken off from there. René: Wow! That is really, really cool that you would take that leap and with your young children and everything and here you are and you’re in the middle of this movement to improve veterinary care in Hong Kong. How does the community view your specialty? Are the general practitioner vets over there, are they willing to give themselves? Is it easy to get clients or do you really have to work to get the word out that your practice exist? Dr. Cahalane: Well, I think yeah, that’s a great question. I imagine what New York must have been like before the EMT showed up or before specialists showed up even. And the veterinarians in Hong Kong here are spectacular. I mean they didn’t – they’ve learned – they’re well-trained and they’ve learned to do so much on their own that they’re sort of – they do everything. They do everything from ultrasound to nail trim to advanced surgery. Dr. Cahalane: And so as specialists, we’re very focused. And I think that’s just the big difference. So the population here of veterinarians, the market was really great and there are tons of pets and a lot of great vets but the specialist aspect just kind of elevate the game a bit and it takes the profession up a notch for those things that the general practitioners aren’t comfortable with or maybe haven’t seen before. Now, we have a whole team of specialists in Hong Kong that can help them with that. So they’ve really sort of caught on to what referral means that we’re not competing for the same cases. We’re here to complement each other and to provide the best care that we can for each pet. René: And how about the pet parents in your city? How – well first, let’s back up a little bit. How do they view the role of their pets in the household because I think that determines like how willing they are to go the extra mile to see a specialist? So what is your understanding of how they have their pets? Dr. Cahalane: It’s really incredible. When I was a kid, we had a dog and the dog was just kind of our family dog. It was different than my sister and I. It wasn’t one of our – one of the family children. And then I think things have evolved in North America that pets are viewed a little more as family members now. And in Hong Kong, it’s like that dog in the yard phase never really existed. And so there are a lot of first-time pet owners. But instead of that dog being, “Oh, it’s just a family dog,” that’s their family. That’s their child. So they’ve skipped over that whole sort of era of pet ownership and they’ve sort of dived right into pet parenting. And it’s an amazing difference to see because they would not necessarily have the experience of say, “OK, I know I need to have a family that takes care of my pet through its whole entire life,” and they may not have those basics down but all they know is that they want the absolute best that they can find for their family member which happens to have four or three legs. René: Wow! That’s really cool because I grew up the same way. The dog was the dog and he was an outside dog. He wasn’t even allowed to be in the house. And boy! In my lifetime, things have changed. But we had to go through that learning phase and our animals suffered because of it. So I’m really happy to hear that the dogs and cats and other pets there are having such great care during their lifetime. I think people think about Asia and they’re unsure about how pets are really kept here. But no, they have – most pet owners have completely bypassed the dog in the yard. And now, they’re in booties and crams and in being pushed around in strollers and stuff. So it’s pretty incredible to be a part of. René: And I’m just curious but is there a common size of dogs that you see there? Do they go with old breeds or are they more partial to smaller ones or…? Dr. Cahalane: Certainly more partial to smaller dogs I think. There are a lot of people in a very small space here in Hong Kong. And so to have a big dog, you need to have more room. And a lot of people have smaller pets. Poodles are very popular here, Toy Poodles, Schnauzers, and Pekingese, it’s a little kind of pugs, a little that sort of size is most popular. But I see everything from kittens to Bernese Mountain Dogs here. René: Now, when it comes to special needs and handicapped pets, what are their feelings about that? I mean I don’t know. Do you do amputations there? Do you deal with those situations a lot? Dr. Cahalane: I do. Now again, I think that general practitioners here who a lot of them will do amputation if that’s what is indicated and what needs to be done. They’re not necessarily referring to me for that. As a specialist, I do tend to see the people who are more interested in limb spare. But I am the first person to recommend amputation when I think it’s indicated. And I think there’s – again, with the new pet parent population, there is a whole discussion or even culture that they’ve missed out on which is, dogs and cats have great lives when they have only three legs. And so, there is an education that needs to take place here and it is taking place here that it’s OK to do that when it’s what’s best for that pet. René: Now, what would be the viewpoint, the average viewpoint of a pet parent there when it comes to a handicapped pet? I mean are they accepting when it does happen or …? Dr. Cahalane: I think that what – I have had clients come in to me and asked about wheelchairs for their dogs when a dog just had a cruciate rupture. They are absolutely willing put their pets on wheels. And so sometimes I have to step back and say, “OK, we don’t really need to – we don’t need – we can do some other stuff and try to make the legs work a bit better.” So they are – a lot of people are ready to put their pets in wheels or with prosthetics and things. But I think that they see amputation has almost – instead of looking at it as a way to relieve pain, they see it as giving up, “Well, I will only amputate if I have to give up.” And so that’s kind of what I’m trying to change when I talk to clients and say, “It’s really not giving up. It’s a treatment and it’s not a bad thing to do.” And a cart might help a pet get around. But what we’re trying to do most of the time with amputation is alleviate pain. And so, that’s a big discussion that I have to have pretty frequently here when I see patients where amputation is indicated. René: Yeah. That is interesting because we get some of that here but when a veterinarian presents amputation, of course, it’s the last thing anyone wants to hear. But when it comes to hearing the message that it can alleviate pain, I mean I think more people are willing to say, “OK, we’ll do it.” So we’ll try to help you out in that area for sure. Yeah. So what about pet parenting in general? How does it differ from us other than OK, the pets are family members but do they go everywhere with them? Are there pet-sitters on every corner? I mean how integrated into society are they? Do they get to eat in restaurants, that kind of thing? Dr. Cahalane: Lots of pets eating in restaurants. Yeah. I live in a small fishing village kind of thing, about 30 minutes outside the city. And on the weekends, all you see are people with their dogs and the dogs are sitting at the table in outside restaurants and really going on walks and a huge dog culture in the little town that I live in, just outside Hong Kong. Yeah, it’s great. It’s great. I think that the other way that pet parenting differs here is in the way that they care for geriatric pets or sort of their elderly. They will just go to no end. They will carry around oxygen tanks for their dogs in heart failure. Yeah. So it’s really pretty amazing to see the long-term care that people are committed to here. And of course, it’s like that in the States too. I know that there are lots of people who go to every end to care for their geriatric pet. But it is really astonishing here what levels people will go to. René: Yeah, especially when it comes to end of life. It’s interesting that you mentioned that because one of the few members that we’ve had from Asia, when her dog passed away from cancer, she had what I would call a wake I guess. It was a service. Is that a common thing there? Dr. Cahalane: It is. It is. And they – a lot of people like to be present for cremation, which was new to me that they want to be sure that it’s their pet that’s being cremated and that those ashes that they are getting back. And they really do have services and entire families will come for euthanasia when that does happen like cousin, not just the members of the immediate family but neighbors and friends and aunts. And so it’s really a big family that comes together like we would for our human family members. It’s really something else. It’s very special. René: Wow! I would say that for the most part, what you’re describing is a culture that is a little bit more advanced than the majority of us here in the US. I mean I know that for senior animals, a lot of people are like, “Well, it’s time to let them go,” and that kind of thing. And I just think it sounds a lot easier for a pet parent when they’re wrestling with these end of life situations. That’s really cool. And we’re going to my last question for this segment. What would you say is the number thing that we in the States, and even our members in the UK and other Western countries, what can we – what’s the number one thing that you would say we can learn from? Dr. Cahalane: I can tell you the number one thing that I’ve learned from them, and that is . . .
as long as we keep a pet’s best interest in mind always, that it’s OK to try even when the odds aren’t that great. In my past life and I am more often than not amazed at the outcome that we can achieve when people are willing to really go the distance and let you do everything that you would do as if you were treating a human. But again, remembering to always keep that pet’s best interest in mind. It’s important to not go I guess too far. But I am amazed that the successes that I’ve been able to have with my team on board and with pet families on board trying to give us more time and more quality time with their pets. It has really been an amazing experience and a transformation as a surgeon. René: Oh, I bet. And in your TED talk which we will discuss next but you do mentioned it, those cases, and I was just blown away by your stories that you talked about there and going the extra mile and having a great success. So we’re going to talk about that next. And I hope everybody will stay tuned. Dr. Cahalane: Thank you so much. I hope so too. Jim: Yes, thank you for your time Dr. Cahalane. This has been fascinating. Listeners can learn more about your work in Hong Kong at VSH.com.hk. And I can’t wait to share with them what you’re doing to raise awareness about the Not One More Vet campaign. Please tune in to part 2 of this talk where we will discuss the alarming suicide rate among veterinarians and what we as pet parents can do about it.